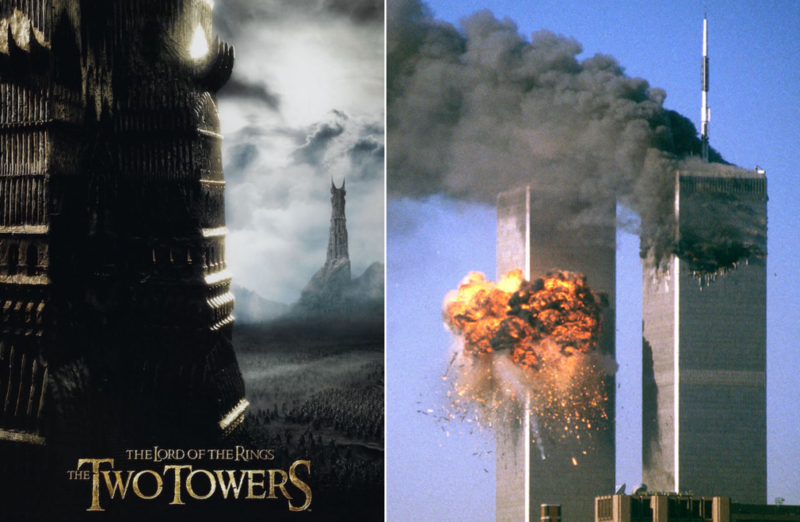 The OMEN that 911 truly was, looks a little bit like THE LORD OF THE RINGS . Remember the Two Towers? They are actually representative of the Twin Towers. When WTC I and II came down in New York City on September 11, 2001, it was a message to humankind that the reign of the Almighty Dollar was coming to an end . As a nation’s currency goes, so goes its destiny. America’s financial strength and economic prowess were on the wane, and soon to be greatly diminished. Just as the World Trade Center (symbol of the financial capital of the American Empire) was pulverized into dust, the US Dollar would soon be swept into the ash heap of history. Just as we see the economy collapsing all around us, exactly 7 years after the original 9/11 apocalyptic events in 2008, and again 7 years later in 2015 … and again in …. When the Ring of Power was finally destroyed in The Lord of the Rings, just like the Pentagon (ring-shaped command center of the military-industrial complex) was mortally wounded and damaged, another strong message was sent and was equally clear: America’s military might and superior force would be reduced to rubble in the twinkling of an eye. The USA would likewise see the demise of its all-pervasive state-sponsored terrorism. This, because the nation had lost all moral ascendancy. Besides, the U.S. Empire could no longer be sustained politically, financially, practically or ethically, as the seeds of its own destruction had fully sprouted. The most fatal seed grew into that extremely corrupt and predatory form of corporate, crony capitalism which was so socially unconscious, and so environmentally unaware, it was quite doomed from the very beginning. The GOOD NEWS is that the nation – its people – will now be compelled to beat their “swords into plowshares” and their “spears into pruning hooks”. Just as the Phoenix rose from its ashes, so, too, will America ascend to even greater heights … as long as the USA ascends with the guidance of the highest of ideals, the loftiest of principles and the noblest of intentions. And, that the USA reforms, and transforms itself, in good faith, in earnest and with all deliberate speed.